My first steps into popular culture were made through movies. Blowing up the second Death Star. The Scarlet Buccaneer‘s pirate ship. That deeply disturbing Italian horror sci fi movie from the 1970s which I was clearly too young to watch and had clearly been put on Saturday morning on ITV by someone who either wanted to be fired or wasn’t paying attention. The theme tune, no word of a lie, was prog rock guitars and the words ‘GREEEEEN SLIIIIIIIIIIIIIME!’ Axl Rose’d over the top of them constantly. Then there was Oliver! And The Hunt for Red October and so many more. Sitting in the dark watching the screen light up and trying, and always failing, to spot the moment I was pulled out of my head and into the movie. The hero of Reel Love by Owen Michael Johnson has similar experiences. Overawed by cinema the first time he sees a movie he’s drawn back again and again. He makes friends, he makes movies, both are differing degrees of awful as he fishtails sideways and only a bit aflame through early adolescence. Very little hurts worse than betrayals in that time period and he gets them. And one of the things that does hurt worse too; heartbreak. The struggle to be achingly cool and disaffected, the fight to balance life and work. It’s all here and all played out with brutal honesty. The middle chapter, complete with appropriate Empire Strikes Back joke, reminded me of Marc Ellerby’s work. Both are fiercely honest and both refuse to gloss over the bad bits. Everyone is someone’s hero. Everyone is someone’s villain too and the middle section is powered by that realization and its consequences. We all mess up. We all get messed up. What we do next is what counts. What our hero does next is both teach and learn. Each section of Reel Love is distinctive and I’m hesitant to go into spoilers but chapter 3 is the best of a very strong trio. If the first is about the ‘first time in a sweet shop’ love of cinema and the second is what happens when that love collides with adolescence, this is the Clerks 2 of the three chapters. Still funny, still cheerfully foul in spots but dignified and calm with it. That calm comes in large part from the way the story changes. Our hero is still our hero but his story is an adjunct to others and, as we see in the final pages, all of them ultimately lead to the same place. A place where hurt is healed. A place where no one is alone. It’s a ridiculously tidy, gentle tie off to a story that feels intensely personal and at the same time mildly fantastic. Which, as we know, is often the recipe for a really good movie. 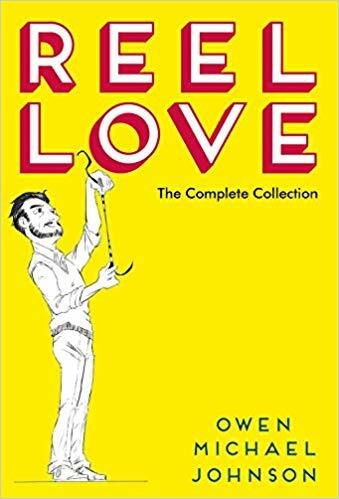 Expertly drawn, exuberantly planned, wildly funny and clear eyed, Reel Love is an absolute gem. If you’ve ever left a movie humming the theme tune, this is for you.